Hot foil stamping is a method often used to embellish and emboss premium print media. It’s used on things like letterhead and wedding invitations to add a touch of luxury. The operation is actually quite simple, where a custom die is heated, pressed into a heat transfer foil, and then transferred on to the print media. Some of the very first manuscripts used gold leaf embossing to decorate intricate calligraphy. You can also see it often used to decorate the sides of religious texts. Professional foil stamping machines are often pricey and the cheaper ones you can get from eBay are usually poorly made. [Lindsay Wilson] found this out when he purchased a low-cost hot foil stamping machine that was too difficult to use reliably. It got shelved for years until he had another hot foil stamping project. This time he was prepared. He took the machine apart and robust-ified it by attaching it to a heavy-duty arbor press. He also retrofit the heating assembly with his own temperature controller to improve the accuracy for the foils he wanted to use. We’ve seen our share of commercially available HDTV antennas that work really poorly. For at least four years now we’ve gone without cable television, using a coat hanger antenna we made ourselves to record over-the-air broadcasts. But it’s a pretty ugly beast — we’re lucky enough to have an attic in which it can be hidden. If you’re in need of free television and don’t want an eyesore of a an antenna try building this foil and cardboard version. Even it if doesn’t work at all you’re only out about ten bucks. The expensive part is the matching transformer which converts screw terminals to a coaxial cable connection so that it may be connected to your HDTV. You’ll need a few nuts and bolts, but we assume you can beg, borrow, or steal the tin foil, cardboard, and glue that round out the parts list. Glue, measure, cut, fold, fasten, finished! You’ll be watching horrible summer TV in no time! If it doesn’t perform as expected just reuse that connector and try your luck with a fractal antenna. Hacks like this one don’t help us recover from extreme pack-rat behavior. Driving home the point that one should never throw anything away [Peter] built a flex sensor from component packing material. It uses the black conductive foam in which integrated circuits are sometimes embedded for shipping. Above you can see the grey rectangle which is the sensor itself. in the background of the image, each component used in the build is labelled except for the tape. The project starts with the foam being cut to the appropriate size and thickness. He does the same with some aluminum foil, then rips tape strips to act as the enclosure. Fine wire from some cable shielding serves as the two conductors for the sensor. He attaches each wire to an upturned piece of tape, followed by the foil, and finally the foam. When the two halves are assembled in the video after the break, [Peter] hooks up his multimeter to show the change in resistance as the sensor is bent. Apparently it’s been around for fifteen years but using foil impressions to pick locks is new to us. This is similar to using bump keys but it works on locks that are supposedly much more secure. 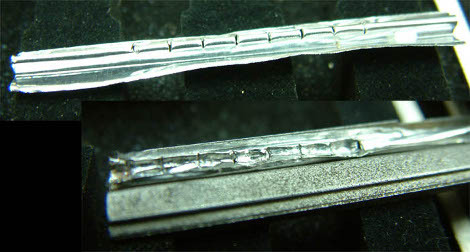 This method uses a heavy gauge aluminum foil to grab and hold the pins in the correct place for the lock to be turned. The foil is folded over and slits are cut where each pin will fall. It is then inserted into a lock on a tool shaped like a key blank. Jiggle the tool for a bit and the cylinder will turn. This just reminds us that we’re much more dependent on the good will of our fellow citizens to not steal our stuff, rather than the deterrent that a lock provides. We’ve embedded a detail and fascinating demonstration of this method after the break. The materials in the video are from a Chinese-made kit. We’re not sure where you find these types of locks, but we don’t feel any less secure since our keys could be obtained from a distance anyway. Update: Video now embedded after the break. The link is down but you can try the Google Cache version.